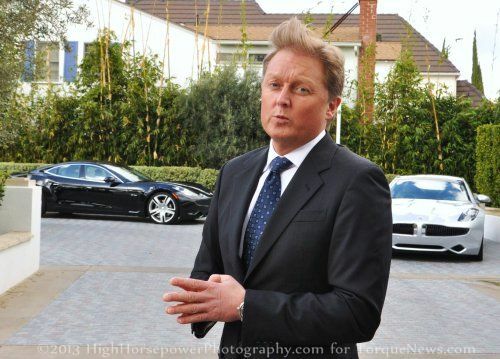 While details are currently limited, Fisker Automotive announced this morning that company co-founder, lead designer and company namesake Henrik Fisker has resigned as the executive chairman of Fisker Automotive – with his immediate departure from the company that bears his name leaving us wondering if the end is near for the innovative luxury EV builder. Fisker Automotive has not yet commented on the departure of the man who played the largest role in bringing the Fisker Karma to life but this move leaves many of us wondering if Henrik Fisker is just moving on due to a disagreement with other company management or if he is bailing out of a sinking ship. Fisker Automotive took their first major hit when the US Dept of Energy backed out of a multimillion dollar loan agreement but that proved to only be a minor setback compared to having their battery provider A123 Systems going out of business. It is very difficult for a luxury electric vehicle company to build cars without the high powered batteries so when A123 went under – Fisker Automotive essentially went idle at the production stage. The company continued selling cars that had already been built and shipping but when Hurricane Sandy destroyed hundreds of ready-to-sell Karmas in 2012, the company took another massive shot on the chin. With many of their cars destroyed, no ability to build new cars and what analysts believe is a serious shortage on cash flow, company management publicly began looking for prospective buyers in 2012. For more information on the saga of Fisker and A123 Systems, click here! I have been fortunate enough to have dinner with Henrik Fisker and he is the type of auto executive that makes me love working in the industry. In speaking with him, it was evident that designing and selling vehicles isnt about dollars and sense or cost cutting and advanced marketing strategies. He is a man who is passionate about vehicles – all sorts of vehicles – and his passion for just about every aspect of the automotive world was clear while speaking with him. More importantly, he had a powerful passion for the luxurious Karma Extended Range Electric Vehicle that bears his name. Talking to some execs (from other automakers) about their products brings about responses that are clearly cooked up and scripted by some marketing or PR expert…sort of like they are trying to talk me into buying the car in question. In speaking with Mr. Fisker, it was more like he was explaining why they made the decisions that they did with the Fisker Karma and highlighting the many high end features – making of an in depth look than the prewritten press release that many execs unload when questioned. The way that Henrik Fisker talked about the Karma project and how he believed in the extended range EV was stated with a genuine enthusiasm that further bolstered my interest in the vehicle. Also, having had the pleasure of spending a few hours tearing around the Southern California area in the Fisker Karma – I can attest that the Karma delivers on every promise made by Henrik and the Fisker brand. Prior to starting up Fisker Automotive, Henrik Fisker spent time designing some of the most well known luxury cars in the world from the likes of BMW and Aston Martin. Even though it looks as though Mr. Fisker has left behind the dream of the Fisker brand, I look forward to seeing what he has planned in the future. On the other hand, the future of Fisker Automotive seems far less stable. The company has been meeting with possible investors or buyers including several Chinese companies but even with a huge infusion of cash, it could prove to be difficult for the luxury EV builder to continue on without the man who penned their first vehicle and lent his name to the original project. Even without the charismatic leader, I still love the Fisker Karma based on that fact that it is a truly remarkable vehicle and I hope to see the company succeed regardless of who is paying their bills. However, the next few months could be the toughest few yet for the high end automaker. Our own John Goreham talked back in November about the future of the Fisker brand and it looks like his grim expectations could come true. Click here for a look at John's prediction late last year.